A relatively new product recently introduced to meet the needs of the heavy industrial static and mobile plant is Interlube's HDI pump range of heavy-duty industrial centralized greasing pumps. 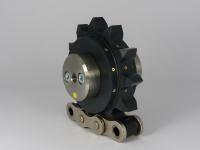 these units are specifically designed for the most arduous, aggressive and demanding applications. These units, when used in association with 'progressive' divider valves, ensure that lubrication is consistently and efficiently delivered to bearings and pins. The HDI pumps are available with 3, 6, 9, or 15 litre reservoirs, and are suitable for all quality of grease up to NGLI 2 viscosity, generating above 400 bar pressure, which is adequate to overcome resistance caused by tight bearings. All pumps within the HDI range are easily installed and serviced, unlike some pumps currently on the market. The mounting positions will match those of the Lincoln 203 range of grease pumps. The HDI Range incorporates, if required, a 24v. D.C. controller with adjustable 'run' and 'dwell' settings which includes a remote alarm and low-level indicator. The pump has a manual override, which can be fitted remotely to the unit (eg driver's cab or control room), and installation and maintenance is quick and simple. 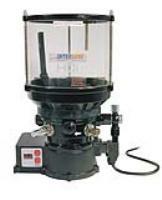 The HDI pumps are designed by experience lubrication engineers who know the lubrication market. The pumps are manufactured in the UK at Interlube's Plymouth factory and exported throughout the world and have been well tried and tested in all types of hostile environments. Pumps have been successfully installed to serve many varied applications and in locations throughout the world. HDI Pumps have also been fitted to a range of agricultural machines, and the picture below shows an installation,in 2009,on a self propelled sprayer. Please send me more information on Introducing the NEW Interlube HDI range of Grease Pumps.